As anti-immigration policy measures in Europe grow stronger, a new dynamic has emerged in the study of mixed migration which has human rights advocates concerned. Migrant arrivals to Europe have significantly dropped in 2017: UNHCR and IOM reported only 48,238 migrant arrivals from June to November 2017 – compared to 104,510 arrivals in the same period in 2016. Migrants from the Horn of Africa have decreased by nearly two thirds as well: from over 30,000 in 2016 to just 8,688 arrivals recorded so far in 2017 (5,616 Eritreans, 2,393 Somalis and 679 Ethiopians). While European immigration supporters might see the decrease in migrant arrivals as a positive trend – a deeper look shows a grim and complex reality amid reported increases in abuse and protection issues for people on the move. Despite the drop in arrivals, the risk of death or abuse for migrants seeking to reach Europe is alarmingly high. In 2017, an estimated 2,925 people have gone missing at sea on routes across the Mediterranean. Moreover, severe protection risks face migrants along the entire journey – including abuse, torture, kidnapping and death. And, although the flow of migrants to Europe has temporarily slowed, migrants traveling to departure points in Libya has not stopped. This means that many potential migrants are stuck in transit countries, most notably in Libya. Migrant smuggling, and trafficking groups have consolidated power and control along the dominant migration routes. These groups have the networks and influence to exploit the situation and keep migrants on African shores – exposing tens of thousands of people to human rights violations and abuse. Throughout 2016 and 2017, many African migrants used the route through Libya to reach the Mediterranean coastline to embark for Europe. In efforts to slow migration, European leaders looked to partner with local authorities and other actors in Libya to stop migrants before they depart. As part of this agreement, Italy is providing logistical, technical and operational support for the Libyan navy, who have stopped ships and put more pressure to curb migrant movements. However, along with more legal means of curbing migration, internal politics and infighting between militant groups and migrant smuggling rings have also had significant impacts on migrant departures. Libya’s weak governance systems struggle with corruption and insecurity which have enabled the opening of a new arena for traffickers to exploit stranded migrants. This is consistent with numerous reports of migrants suffering from severe human rights abuses on the journey to Europe, most notably in the Sahel and in Libya. According to Reuters, armed groups in Libya have also been preventing migrants ships from leaving on the route through the Mediterranean to Italy. The groups, made up of civilians, policemen and soldiers are detaining migrants and have been accused of running detention centers for migrants taken or turned back by smugglers. Migrants, including refugees and asylum seekers, in Libya experience torture, sexual assault and forced labor. These violations are perpetrated by a host of actors, including smugglers and traffickers. Migrants are unable to move freely and in some cases there are reports of people being sold into practical slavery. One particularly famous case highlighted in the media followed the Facebook videos recorded by traffickers of Ethiopian and Somali migrants held for ransom under brutal conditions in order to scare families into sending money. It is important to note that by the time potential migrants arrive in Libya, they are already at one of the last stages of their journey to Europe. Migration from the Horn of Africa is expensive, costing over USD 3,800 just to reach North Africa, and typically well over USD 5,000 to reach Europe. Financing movements can bankrupt migrants and their families and involve loans, sale of assets, community payment schemes, and working along route. Once they’ve made it to Libya, migrants have typically already endured increasingly brutal human rights abuses, and are unable or unwilling to turn back. These conditions only make it easier for smugglers and traffickers to exploit and abuse ‘trapped’ migrants who are unable to move freely. The Libyan city of Sabratha has been at the epicenter of the migrant ‘detention’ problem. Sabratha, in the coastal port city about 80 kilometers west of Tripoli, had been operating as a major migration hub for much of 2017. Over the last few months, armed groups sought to establish dominance over the lucrative trafficking and smuggling networks. Tensions boiled over in September when at least 30 people were killed in an outbreak of fighting between armed groups in Sabratha and the surrounding areas. Weeks of conflict left thousands of migrants were caught in the crossfire, trapped by violence and unable to leave the area. United Nations agencies have been working to meet the urgent needs of the more than 14,000 refugees and migrants who had been held captive in numerous locations along the coast outside of Sabratha. Libyan authorities estimate that an additional 6,000 migrants and refugees remain captive by smugglers. If these figures are confirmed, it would bring the total number migrants held to 20,500 – including those in official detention centres. UNHCR and local authorities are working to respond to the growing needs of the migrants, who have been living in ‘deplorable conditions’. Detention centres and assembly points are at full capacity and lack basic amenities, like water tanks and sanitation facilities. 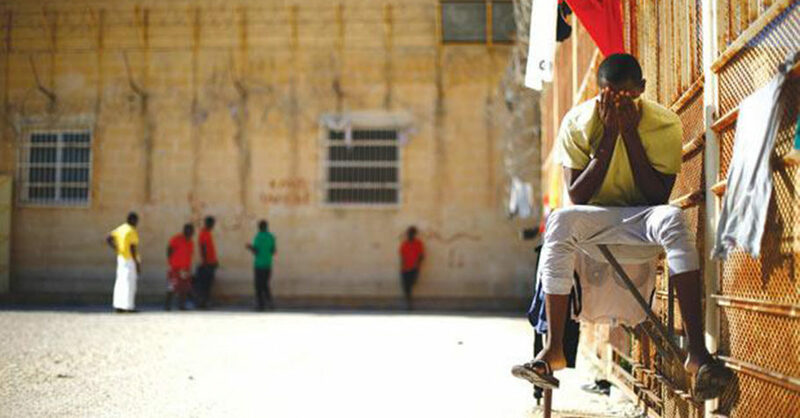 The scale of needs has overwhelmed the already weak facilities and meager resources of the Libyan authorities. The recent clampdowns on routes to Europe via Libya have been examined in parallel to a reported increase in attempts to reach the continent via other transit points along the North African coastline including from Tunisia, Morocco and Algeria. In August 2017, 170 people had been caught trying to depart from Tunisia by boat. And in September, the Tunisian navy has arrested more than 550 Tunisian and African migrants trying to sail to Europe, official figures showed. In August, the Spanish maritime safety and rescue agency and the Spanish Red Cross rescued nearly 600 people from vessels off the coast of Tarifa. In fact, the International Organisation for Migration (IOM) has said the number of people arriving in Spain by sea in 2017 is likely to outnumber the number arriving in Greece. And, a recent spike in reported ships off the coast of Algeria points to a new route to Europe from there. However, analysts note that these new trends do not demonstrate a new route to compensate for the Libyan route. The ‘new’ North African routes are composed of different profiles of migrants (those leaving Libya are largely sub-Saharan African and Bangladeshi while departures from other North African points are made up of primarily North Africans). Further, new reports already confirm that migrant boats are again leaving from departure points across Libya. Rising figures indicate that migrant flows from Libya were never fully stopped – only delayed – and migrants will continue to enter the Mediterranean Sea from the Libyan coastline. Anti-immigration policies are seen by some as directly contributing to human rights abuses in Libya and other countries on the route to Europe. Evidence highlighting wide-ranging human rights abuses facing migrants continues to hit the mainstream media as well as policy and academic circles. And research shows that strict migration policies and restrictions don’t stop people from traveling, they only make the journey more dangerous by forcing migrants further underground and more reliant on smugglers and facilitators who can more easily exploit them. Yet despite mounting research and analysis, policy considerations remained focused on limiting irregular migration. To fully address the situation, policy makers must look beyond just stemming migration to Europe, and ensure stronger policies to protect people on the move and explore options for alternatives to unsafe irregular migration.